How do you find the best cabin for your money on a cruise ship? Cabin selection is one of the most important things to do before embarking on a cruise. People have different needs in their cabin, so choose the one best suited for you. Besides the obvious stateroom categories, other factors in cabin choice can greatly affect your cruise. 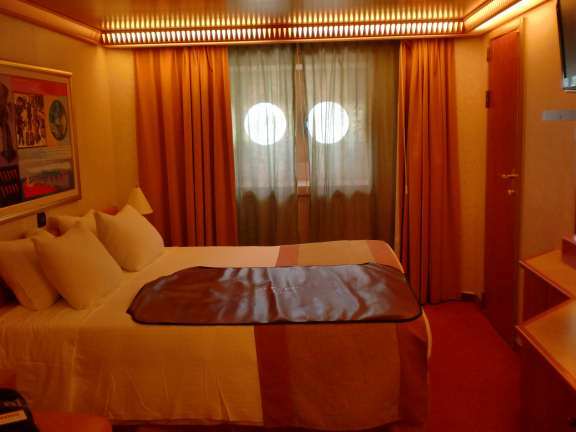 The categories are assigned to various rooms depending on their size, whether they have windows or balconies, and their location within the ship. Not all rooms in a given category are the same. Some hold more people, some have special features to make them more accessible. Prices go up with each jump in category classification. Cabins on higher decks often have higher prices for the same room as one found lower down for a bit less. Centrally located cabins cost more than those closer to the bow or stern on some ships. Not all cabins are alike, and even the interior cabins range in size. For families traveling with more people than one room will hold, some cabins have doors adjoining them to the next room. 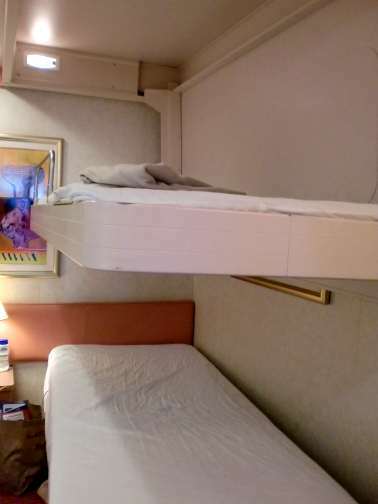 On the Carnival Liberty, the inside cabins in rows of just interior cabins at the middle of the ship were larger than the ones across the aisle from outside cabins. With both the interior and verandah, some cabins (or balconies) out at the very front or back ends of the hallway were just a bit bigger, yet in the same category as the ones next to them. It always helps to look at the ship’s deck plans before booking so you can find the best cabin in the category you can afford. All the major cruise lines have deck plans to all their ships on their websites. The cabin categories are color coded so you can tell at a glance which cabins are in your preferred category. Some cabins are really hard to get though. Even booking nearly a year in advance we’ve never been able to get one of the ones at the end of the row with the extra large balcony as they are always already taken. I normally prefer a cabin on a deck that has nothing but guest rooms, and that both the decks above and below have nothing but guest rooms as well. Usually the nights are quieter that way. People with motion sickness problems might want to pick a cabin on a lower level of the ship and as close to the center of the vessel as possible because both those things reduce the amount of motion felt. The higher up and farther to the bow or stern the room sits, the more exaggerated the motion of the ship becomes. Except on very small ships where the stern has more stability. Sometimes noise comes from unexpected places. On the Liberty, we had a cabin on deck 6, right near the middle. Deck 5 had public areas, decks 7 and 8 did not. So we would have expected noise to come from below. Up on deck 9 though, the Blue Iguana and Red Frog bars are located about the center of the ship as well. They had a tendency toward having loud parties late into the night, and we could hear the music in our room, where we never heard anything from deck 5, which had shops below us as well as a casino. Luckily I always bring ear plugs when I travel. Theaters normally sit near the bow or stern and can get noisy. On the first cruise I ever took I had a room directly underneath the stage and found zero chance of sleeping during a show. Most vessels do not have rooms under theaters though. 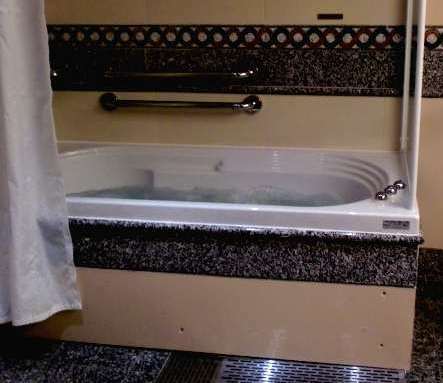 If you can afford it, suites are spacious and some have amenities such as a whirlpool tub. Suites come in a variety of sizes, with the price escalating as the room grows. 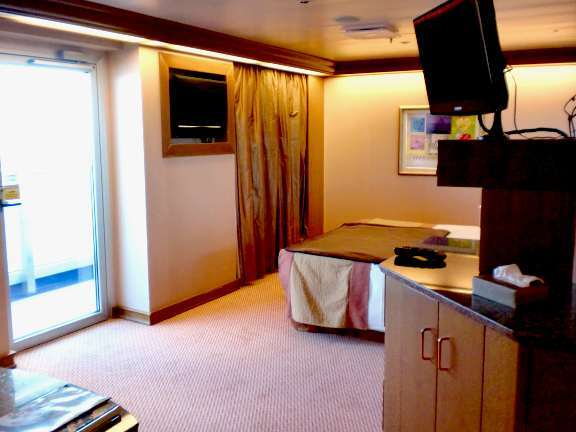 Larger suites on some cruise lines such as Holland America come with added amenities such as concierge, free laundry service, and a private lounge for suite guests only. Balcony rooms are quite comfortable. In warm climates the balcony gets a lot more use than when cruising to a colder place. Window rooms on the Liberty were a bit bigger than the standard balcony room, although the added space from the balcony probably gave those rooms a little more space overall. Inside rooms are always the cheapest way to go, but you can’t tell night from day without turning the television to the bow cam channel. Standard inside rooms are quite small, so look for side halls or corners where larger rooms of the same category might lurk. Window (or porthole) rooms get you out of the dark hole of an interior room without the cost of a balcony, though they do cost more than the interior rooms. When I stay in an interior room I like to turn the TV on to the bow cam channel with the sound off at night. As long as it stays dark outside, I don’t even notice the TV is on, but when the sun comes up I know it’s morning. Sort of like an electronic window. 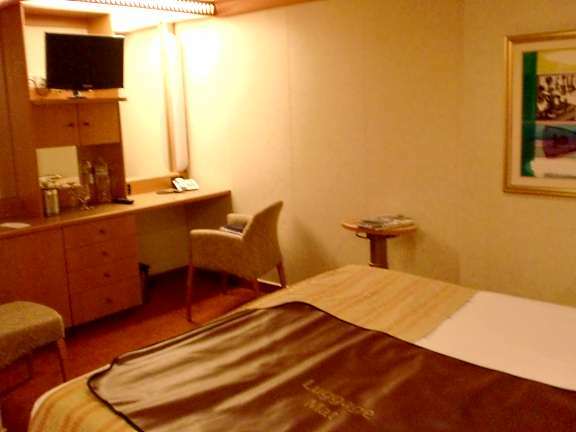 Other considerations for room choice include what parts of the ship you like to visit most. Going up and down from one level to another usually takes less time than walking from one end of the ship to the other. If you choose a room above or below the places you go most you can get there more quickly than if you book at the opposite end of the ship. 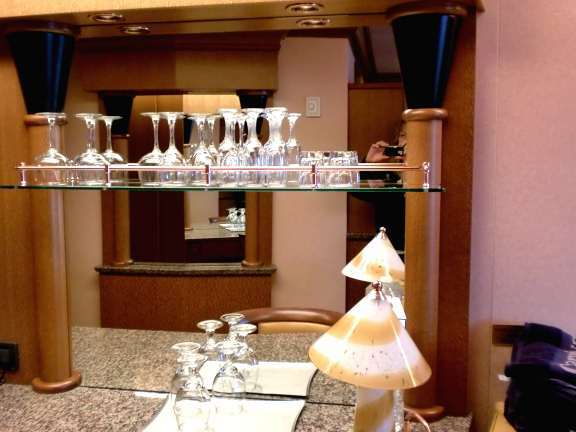 Then again, maybe it’s a better idea to book at the opposite end of the ship from your preferred hangouts to walk off some of the abundance of delicious cruise food most passengers eat. The amount of people staying in a room also affects room selection. 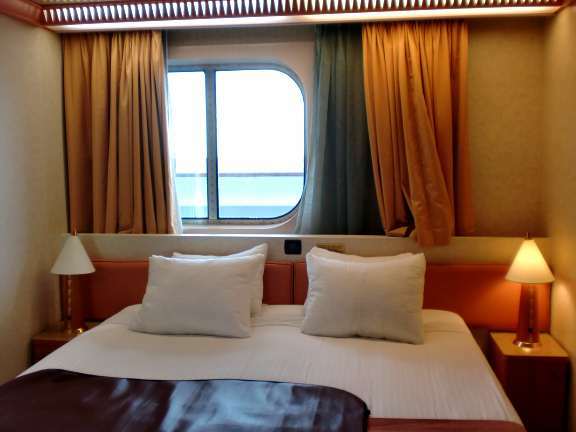 Within a given category, some staterooms may sleep only two people while others sleep three, four, or even five. When I took a cruise on the Norwegian Sun with my son and grandson we had to make sure to choose a room that slept three. That room slept the third person on a couch that folded into a bed, but some cabins have one or two beds that pull down from the ceiling. Those add sleeping space without taking up floor space, a nice feature when cruising with kids. If you aren’t particular about your room location or amenities, try booking with a category guarantee rather than a specific room. You will get at least the category you booked in, and often get upgraded to a higher one at no extra charge. For a complete list of blogs about cabins see My Cruise Stories Ships and Cabins page. This entry was posted in Carnival, Liberty, Shipboard Life and tagged cabin selection, cruise, cruise ship staterooms, pictures, reviews, travel. Bookmark the permalink. Great info, I would never have thought of half that stuff. This was handy info. I have never been on a cruise but do plan to go on one someday. The rooms are bigger than I imagined. I know some of them were suites but I have always heard the rooms are tiny and it looks like you can at least walk around the bed:) What is the brown thing on the beds? Some of the inside rooms are pretty small, but I’ve never seen one where you couldn’t at least walk around the bed. The rooms with the beds that pull down from the ceiling might come in handy for your family. When you have more than two people in a room, the extra people are cheaper and sometimes even free. Except the fees and port taxes, they still cost the same. The brown thing is a luggage pad. It’s there to put the suitcases on when people first arrive. My TV makes people look green down the left side but I’m fairly sure I’m not in your cabin. Then again my bed has been made and I’m quite sure I didn’t do that. I demand answers!! On a recent Carnival cruise we were ignorant and had a cabin just under the kitchens and the noise was awful with carts being rollled back and forth well into the 2am hour -subsiding a bit then picking up at 5am. Numerous complaints were met with “we are sorry but we have no other cabins as the ship is full.”. Topping this all off with my wife contracted a bad case of food poisoning and we were told the charge for opening the infirmary was $150 and they would have to wake a doctor. They said the doctor would respond to the calls and the nurse was sleeping and couldn’t provide pain meds. Nightmare cruise – never again! Under the kitchen would be worse than under the stage. At least we could go to the show instead of listening to tromping and stomping overhead. 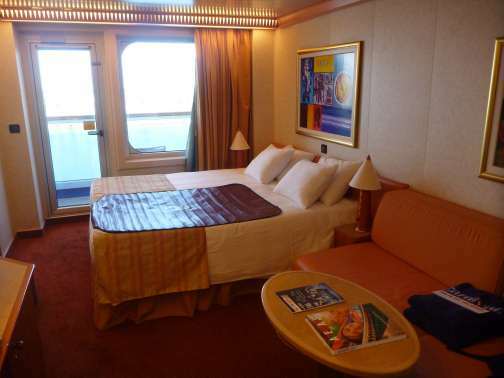 Maybe a noisy room like that is why we saw people sleeping on the Serenity deck on our last cruise. Getting sick on a cruise is the worst, it’s a shame you had such a bad experience. My wife and I like an AFT cabin. We always make sure to see what’s above us and below us before booking. The only time we ever had any problems was on the NCL Epic, we were at the back of the ship, but the noise when the ship pulled into port was crazy. It woke us every time. I just got back from my first cruise on the Carnival Liberty to the Western Caribbean. I would have to disagree with the parts of the ship that exaggerates motion sickness. I had a balcony room on the verandah deck mid-ship and while in the room didn’t feel to bad. However, when I went to lower decks, such as deck 3 for dinner or deck 5 I felt the motion of the ship a lot more. Thus we tended to stay on upper decks. I should also add that we had some rough seas and high winds, so bad that they closed the serenity decks on a two of the nights! Good that you had a mid-ship room since your journey included stormy seas. If you were farther toward the bow or stern on the lower decks that would explain why you felt the motion more there.